SSAT - ESOPHAGEAL HIGH RESOLUTION MANOMETRY CAN UNRAVEL THE MECHANISMS BY WHICH DIFFERENT BARIATRIC TECHNIQUES PRODUCE DIFFERENT REFLUX EXPOSURE. Introduction Bariatric surgery is increasingly performed. Since there are several techniques, effects of these on the esophageal function are still poorly understood. Furthermore, some bariatric techniques proved to be very effective as antireflux procedures, whereas "de novo"? gastroesophageal reflux disease (GERD) and dysmotilities were reported after some bariatric procedures. 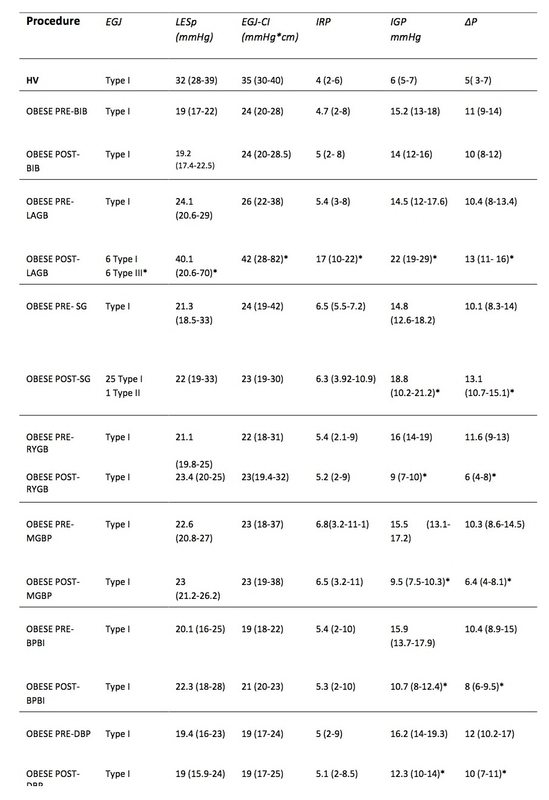 We aimed at assessing the effect of the most commonly performed bariatric techniques on esophagogastric junction (EGJ) function, esophageal peristalsis and reflux exposure using high-resolution manometry (HRM) and impedance-pH monitoring (MII-pH). Methods All obese (BMI>35) patients underwent symptomatic questionnaires (GerdQ), endoscopy, HRM and MII-pH before and one year after surgery. We enrolled only obese without dysmotility or any evidence of GERD, in order to verify the real incidence of de novo GERD. Esophageal motor function and EGJ were classified according to Chicago Classification V. 3.0. EGJ contractile integral (EGJ-CI) was also calculated. Intragastric pressure (IGP) and gastroesophageal pressure gradient (GEPG) were assessed. Total acid exposure time (AET %), total number of refluxes and symptom association probability (SAP) were assessed. A group of healthy-volunteers (HVs) served as control. Results One hundred and twelve obese subjects (39 ±12 years-old, mean weight 135 (97-202) Kg, mean BMI 42 (37-69) Kg/m2 and 15 HVs (normal weight) were studied. Thirteen underwent endoscopic balloon placement (BIB), 12 gastric banding (GB), 26 sleeve gastrectomy (SG), 18 roux-en-y gastric bypass (RYGB), 15 mini gastric bypass (MGB), 16 biliointestinal bypass (BIBP), and 12 biliopancreatic diversion (BPD). All patients showed a significant decrease of weight and BMI one year after surgery. IGP and GEPG significantly decreased after RYGP, BPD and BPBP, whereas they significantly increased after GB and SG. EGJ morphology changed only after GB, with 6 patients showing Type III morphology. EGJ-CI, IRP and DCI increased significantly (p<0.001) only after GB. Hypercontractile and premature contractions waves were present in 40% of patients after GB, whereas ineffective motility (36%) waves were present after SG. "De Novo"? GERD symptoms were observed in 1 SG and 2 GB. Post-operative greater AET (p<0.05) and increased total number of reflux (p<0.001) were present after GB and SG. RYGB and MGB showed a significant decrease in AET (p<0.05) and total number of reflux (p<0.001), whereas BIBP showed a non-significant reduction in AET and reflux events but similar to HVs patterns (Table 1). Conclusions HRM verified that different bariatric techniques produced different modification of IGP and GEPG, leading to different reflux exposure. Only GB and SG can negatively impact on esophageal function and reflux exposure, and they should be avoided in obese patients with pre-existing GERD.